At Shor dental we specialize in Cosmetic Dentistry and perform a number of cosmetic procedures to enhance your smile. Below is the list of frequently asked questions about cosmetic dentistry. Cosmetic dentistry is an area of dentistry which deals with enhancements of the patient’s smile and appearance of the teeth, gums and bite. Cosmetic dentistry can be carried out by means of minimally invasive procedures such as teeth contouring, teeth whitening or more advanced restorative procedures such as veneers, crowns, bridges, dentures and dental implants. Cosmetic dentistry may also involve interdisciplinary care such as orthodontics, periodontics, and oral surgery. What are the indications for cosmetic dentistry? 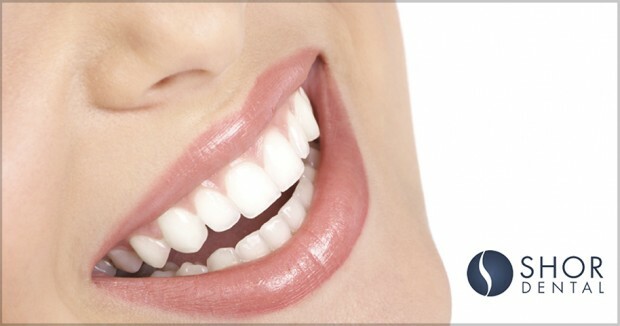 Indications for cosmetic dentistry include situations where the patient wishes to improve or enhance his or her smile. Teeth whitening (dental bleaching) is a procedure for lightening discolored natural teeth. It can also be used for lightening normal colored teeth beyond their natural color. Teeth whitening include applications of the chemical agent via delivery system such as gel, strips or trays. Teeth contouring (also called teeth shaping or enameloplsty) is a procedure where the size and shape of the teeth is intentionally altered in order to improve appearance, function, and patient’s comfort. Most commonly it is performed as a cosmetic procedure for the front teeth with less than ideal form or alignment. Teeth bonding is a procedure where an artificial tooth colored composite material is attached to the tooth with the help of the dental adhesive. Teeth bonding is indicated for the discolored teeth, teeth with chipping, wear, smaller size teeth and teeth with less than ideal alignment. Ceramic veneers is a procedure where thin custom-made facings made from dental ceramics are bonded to the outer surface of the teeth. Ceramic veneers are often used in cosmetic dentistry in order to improve tooth shape and color. Dental crown procedures involve fabrication of the artificial shell-like crowns which are attached to the natural teeth with a dental adhesive. Dental crowns are typically used for the restoration of moderate to large size tooth defects. Orthodontics is a type of treatment where position, alignment, and bite of the teeth is improved with the help of orthodontic movement using braces, appliances or clear aligners. Gum graft is a procedure where part of the gum is transplanted from the roof of the mouth to the areas around the teeth. Cosmetic gum graft can be indicated for the areas of exposed roots around the front teeth in order to improve appearance. Gum plasty is a procedure where a portion of the gum is removed in order to expose more teeth. Gum plasty can be indicated in order to improve appearance of the teeth. Crown lengthening surgery is a procedure where portion of the tooth is uncovered by means of removing jaw bone in order to expose more tooth material. Crown lengthening surgery can be indicated to improve appearance of the teeth. What are the steps involved in cosmetic dentistry treatment at Shor Dental? At the initial appointment we typically perform a detailed evaluation of your teeth, gums and bite. Additional diagnostic records such as radiographs, models of the jaws and photographs are often obtained during initial evaluation. We then prepare your individualized treatment plan and discuss benefits and risks of the treatment. We also discuss the duration of the treatment, number of appointments involved, and cost of treatment. Once we agree on the treatment plan we proceed with an active stage of treatment where procedures are performed on your teeth. Following completion of the treatment you may be recalled for follow up appointments. If necessary we may refer you to other specialists for evaluation and treatment. Why choose Seattle Shor Dental for your cosmetic dentistry needs? Drs. Alexander and Kavita Shor are certified specialist in prosthodontics, a specialty of dentistry which includes cosmetic reconstruction and tooth restoration and replacement. Drs. Shor have a vast experience treating cosmetic cases. Drs. Shor collaborate with other dental specialists and have a support of the dental laboratories who are specializing in cosmetic dentistry.